After a big banana smoothie I made this for dinner just using whatever I had in the fridge. It can be made as a salad or wraps, you might even chose to blend some extra filling as a juicy dressing. 1. Slice up the mango, coconut and tomato into thin strips. 2. Chop the mint and spring onions and mix with the mango mixture. 3. Pile into romaine leaves, squeeze a little lime juice on top and enjoy. You can also chop up the lettuce and have this as a salad, blending some extra filling ingredients together will make a great dressing. I love adding passionfruit to my smoothies. They add such a pop of flavour. You only need a small amount to make a big difference to the taste. This drink has a beautiful tropical flavour. I like to use frozen bananas for a thicker smoothie but you can use them non-frozen as well. Just throw the bananas and pineapple into a high speed blender. Scoop out the passionfruit seeds with a spoon and add them to the blender. Add water and blend until smooth. If you prefer a thinner drink add some more water. It’s nice to save a few passionfruit seeds to top the smoothie with too. Now that bananas are coming down to a somewhat affordable price here in Australia I can get back into making icecream! As long as you have some bananas in your freezer it only takes a few minutes to whip up this tasty soft icecream. You can really add any other flavours you like to the frozen bananas to create you own frosty treat. Try it with some cacao powder, lucuma or some berries. And a tip for freezing bananas: Wait until they are spotty then peel them, break into chunks and store them in a container in the freezer. That way you won’t get frostbite fingers trying to peel the skins off! Either blend all ingredients in a vitamix blender using the tamper or use a food processor. If you have a twin gear juicer like the Greenstar or a single auger juicer you can push the ingredients through using a blank plate or to the manufacturers instructions for nut butters. You’ll need to eat this right after blending unlike dairy based icecream it will become solid and icy if you store it in the freezer. Oh, and this is perfectly acceptable to eat for breakfast on a hot summers day. Icecream for breakfast! The sweet creamy dressing makes the most of the delicious navel oranges that are in season now. It comines well with greens like cos lettuce or cabbage. Top with some grated carrots and raisins for extra sweetness and you’re good to go! Peel the oranges and blend with the tahini. Add the water a bit at a time as needed depending on how juicy your oranges are. You don’t want this to turn into a smoothie! Finely grate the carrots. Using a fine grater will give you more flavoursome carrots. Raw tahini is expensive to buy and I’ve never seen it in Australia or New Zealand, so I make my own in my Vitamix blender. Simply take a couple of cups or more of raw sesame seeds and blend on a low setting. Use the tamper to keep pushing the seeds down as the mixture will rise up the walls of the blender. It will take a few minutes for the seeds to begin to release the oils and start forming a paste. You may need to stop now and again to prevent the mixture from overheating. You’ll be able to feel it warm up on the ouside of the container. Then just continue to blend until you reach a consistency that you’re happy with. So, many of you who are brand spanking new to this whole raw thing might be wondering what the big deal is with green smoothies. What’s so great about them? How many greens do I use? What kind of equipment do I need? How much do I need to make? How long will it keep for? Why can’t I just eat a salad? Or even just where to get started. So this is a short guide that will hopefully answer many of those questions. Just a few things I have learned over the past couple of years. The good news is that it’s easy, it’s delicious and no, it won’t just taste like spinach. A green smoothie is a combination of tender green leaves blended with fruit and water. Pretty much any greens and any fruit you like. Why should I drink green smoothies? Green smoothies are very alkalising on the body, and an alkaline body is a healthy body. Disease loves an acidic environment, so the more alkalising food you can eat the better. They are full of vitamins and minerals and good types of carbohydrates. Greens are full of chlorophyll straight from the sun, which is very cleansing for the blood, making you smell nicer! 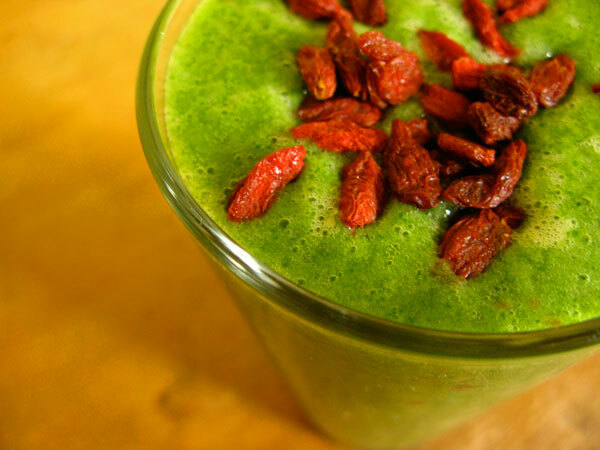 Many people have cured themselves of all sorts of health problems by incorporating green smoothies into their diet. Your body is an amazing machine, if you give it the right fuel, it knows how to heal itself. What’s the ratio of fruit to greens to water? This is up to you really. You might want to start off with around 25% greens until you get used to it and then slowly build that up to as much as you like. Ideally if you are doing a 1 litre smoothie you should be looking at about the equivalent of 1 head of lettuce or more. The amount of water is also up to you. Some people like a thick soupy smoothie that you might even choose to eat like a pudding while other people like it thin and watery. Keep in mind though if you are going to make it a thin consistency you’ll probably want to make more overall so you can still get a good amount of fruits and greens in. What kind of greens should I use? You want to use any type of green leafy vegetable that is soft enough to wrap around your finger. Things like cabbage or broccoli are too starchy and don’t mix well with fruit. Spinach is a great one to start with as it has a mild flavour and blends easily. Among the many other greens to try are silverbeet, chard, many types of lettuce, romaine or cos lettuce is a great one, parsley, celery leaves, mint, coriander, beetroot tops, kale, cavolo nero, asian greens like bok choy, or wild greens like dandelions, cleavers or sorrel. You might even like to try a mixture. It is important to rotate your greens though. Don’t just stick to one kind. Greens have a very small amount of alkaloids in them so your body won’t like it if you overdose on one type of greens for an extended period of time. So try curly kale one day, spinach the next, then parsley and so on. What kind of fruit should I use? Whatever tastes good to you. You could stick to one type or use a few. I do suggest using what is fresh, local and in season if you can although it is nice to have a few frozen berries now and then. Bananas make an excellent base for a creamy smoothie and blend well with most other types of fruit. Then you have a whole variety of things to choose from, berries, citrus fruits, apples pears, tropicals fruits like pineapples and mangoes, you might like to add a some fresh dates for extra sweetness or throw in a few goji berries or raisins after you’ve blended for something to chew on. Why blend? Why not just chew the greens? Many people are not used to eating greens, especially a large amount of greens. It may make some people feel nausous due to low hydrochloric acid levels in the stomach. Blending greens with fruits makes them more palettable and easier on the stomach. Eventually the hydrochloric acid levels will normalise and you’ll be able to handle more greens. Blending allows the cell walls of the greens to be broken up, releasing more of the nutrients and breaking up the fibres a lot more. Often when we chew, we don’t really chew our food enough and it would take a long time to get through a giant bunch of kale! Of course it’s great to get in some extra greens with a salad or two, but green smoothies are just a quick easy way to eat your greens. It’s also a great way to hide them if you are trying to get your kids to eat them, or if you aren’t really into the taste of greens on their own. They are also handy if you are busy working and don’t have a lot of time to make a fancy meal. When should I drink my green smoothie? If you aren’t eating a full raw food diet you are going to want to drink your green smoothie before consuming heavier foods or quite a few hours after. Fruit digests very fast and if you eat it after foods that digest more slowly, like starchy foods or fats or grains or animal foods (if that’s something you are still using in your diet) then the fruit will have digested and starts to ferment on top of the other food, creating gas and digestive troubles and ultimately leave you feeling tired or cause things like candida. If you are eating foods that digest easily like other fruit, salads, steamed vegetables and so on then the timing is not as important. I like to have mine for breakfast, mid morning or as part of my lunch (before eating other food). I also like to drink them after my hot yoga class in the evening to replace the energy I’ve just used up. I don’t really like to eat anything too heavy that late in the evening, so a green smoothie is great. How much should I drink each day? Ideally you want to be drinking at least a litre to experience the full benefits of green smoothies. This means you are either drinking it as a whole meal or over the course of a morning or splitting it into a couple of smaller smoothies to drink during the day. If you’re not ready for that much just yet then start with as much as you can and slowly build it up. Some people go on entire green smoothie feasts where they drink only green smoothies and experience amazing and rapid results like weight loss or curing all sorts of diseases and health ailments. What kind of blender do I need? If you already have a blender, great, use that. Of course if you are really serious about it you’re going to want to get a high speed blender to pulverise those fruits ad greens. Look at getting something around 1000w or more. The lower quality blenders just don’t blend the greens very well and you end up with a pretty chunky smoothie. Here in New Zealand I use a Breville Icon 1000w Blender. The two most popular blenders in the raw food community seem to be the Vitamix or the Blendtec which aren’t really available here. How long will my green smoothie keep for? It’s definitely better to drink your smoothie fairly soon after making it, but it will keep a day or two in a jar in the fridge. It’s better to have a day old smoothie than none at all. One of my favourite containers to use is a wide mouth glass mason jar. It’s easy to carry them to work, the lids have a good seal so you don’t get green smoothie leakage in your bag and you just pop the lid off and drink it straight from the jar. I also like to keep my food in glass as plastic can leach toxins into your food. Well that’s a few of the things I have learned over the last couple of years. I hope they are helpful. There are are great number of people more knowledgeable on the subject than I, so I have included a few resources below for further reading and viewing. I definitely recommend doing your own research. It’s your body and nobody knows it like you do. Green For Life by Victoria Boutenko. She is the woman who made the green smoothie so well known in the raw food movement. Her book gets right into the details of it all and it’s a really easy read. Her FAQ’s on green smoothies are here. I made this for my flatmates last night to eat while we watched a movie. It’s really easy if you keep chopped frozen bananas in the freezer and have a jar of buckwheaties on hand. It probably took 10 minutes to whip up. Place the chopped frozen banana, avocado, blueberries and your sweetener of choice into a food processor or high speed blender and blend until smooth. Spoon into bowls and sprinkle with coconut and buckwheaties for a bit of crunch! Soak whole buckwheat groats in water for about 8hrs. Use a sieve to drain and thoroughly rinse the buckwheat. Spread the buckwheat over mesh dehydrator tray and dehydrate 8-12hrs or until fully dry and crunchy. Another optional extra is to add cinnamon and honey, maple syrup or agave nectar before dehydrating. I went along to Victoria and Valya Boutenko’s talk in Wellington last night. Although I knew their story well from reading Green for Life it was great to hear Victoria tell it in person. She talked about a lot of things I am going to try and implement in my own life. You should try to get in 1-2 litres of green smoothie per day. The best time to drink your smoothie is from 6am-noon as that is when your body can assimilate the nutrients most effectively. You should try to sip away at your smoothie rather than gulping it all down at once. Green Smoothie will keep for up to 3 days in the refrigerator whereas juice needs to be consumed right away or else it oxidises. You should rotate your greens, don’t just stick to one or two. If you blend your greens you can assimilate more of the nutrients, so you don’t need as many as when you eat them whole. If you’re new to green smoothies you might like to start off with a 70/30 ratio of fruit to greens and gradually move to a 30/70 ratio as you get used to the greens. You should use greens that are able to be rolled around in your fingers. Things like broccoli or cabbage are too starchy and will create gas when combined with fruits. Greens are in a separate category to vegetables. Don’t mix in supplements with your green smoothie, it causes your body to concentrate on those rather than the minerals in the greens. Save your supplements for another smoothie. The best time to pick your greens is before they have flowers or have gone to seed. Once this happens the plant sends all the nutrients into the flower and then into the seed. Diabetes and Candida are not caused by too much sugar. You don’t need to cut out sugar. It’s actually caused by too much fat. What happens when you eat sugar is the pancreas send out some insulin to bind with the sugar in your bloodstream. If you have too much fat in your blood both the sugar and insulin are coated with fat and can’t bind together which is where the problems are caused. Dr Doug Graham has similar research on this. She said that you can cut out all fat for one week and you should see an improvement. After that you’ll also find that your body doesn’t want so much fat anymore. If you were at the lecture as well please comment below about what you learned! You can read more about Victoria Boutenko and her family here. Please remember, I’m not a doctor, this is just a blog, so be sensible and do your own research.